The patient is a 54‐year‐old woman with a history of ovarian adenocarcinoma, status postdebulking TAH with lymph node dissection, who presented to the ER with acute on chronic dyspnea. She also had progressive fatigue and chest tightness. She denied other symptoms. She was afebrile, tachypneic, tachycardic, and hypoxic. She had clear lungs and accentuation of the pulmonic component of the second heart sound. Arterial blood gas showed respiratory alkalosis and hypoxia. Because of signs, symptoms, and risk factors suggestive of pulmonary embolism, a pulmonary angiogram was done but was negative for PE. An LE Doppler was negative for DVT, and a GXT was normal, but a CT scan of the abdomen showed recurrent tumor. An echocardiogram was then done, which showed pulmonary pressures elevated to 60 mm Hg. Her symptoms rapidly progressed, and she died on hospital day 7. An autopsy revealed grossly normal heart, lungs, and pulmonary arteries. However, histopathology showed diffuse changes in the pulmonary arterioles. There was thickening of the media, narrowing of the lumen with endothelial proliferation, organizing and recanalizing fibrin thrombi, and rare aggregates of metastatic carcinoma in the lumen of the arteriole. Figure 1. Microscopic images of tumor cells occluding pulmonary arterioles. Although rare, pulmonary tumor emboli have been reported multiple times in the literature. However, clinicians often miss the diagnosis antemortem, resulting in a very high rate of mortality. Often, these patients are misdiagnosed with primary pulmonary hypertension and PE, and therefore treatment is often delayed. The microemboli can present at any time during the course of a malignancy and result from hematogenous dissemination of the tumor, resulting in occlusion of the small pulmonary arteries, arterioles and alveolar septal capillaries, with or without accompanying platelet‐fibrin thrombus. The most common primary tumors involved are gastric and breast, with only 4 cases due to ovarian cancer reported. 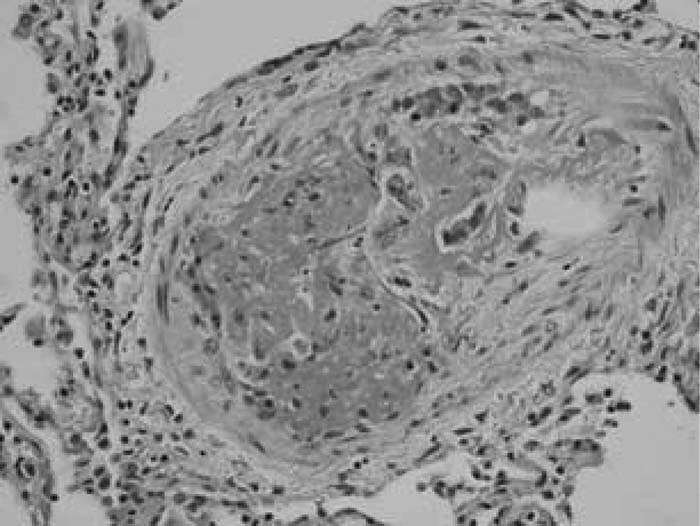 A diagnosis of tumor emboli should be considered in patients with a history of cancer who present with cardiopulmonary complaints. If this diagnosis is suspected and made more often, better diagnostic and treatment options may be offered in the future. Treatment involves aggressive, directed chemotherapy. The hospitalist is integral to improving the morbidity associated with this disease, as these patients invariably present in the inpatient setting. M. Salameh, none; J. Grewal, none. Salameh M, Grewal J. Pulmonary Tumor Microemboli: A Rare Cause of Dyspnea. Abstract published at Hospital Medicine 2008, April 3-5, San Diego, Calif. Abstract 171. Journal of Hospital Medicine. 2008; 3 (suppl 1). https://www.shmabstracts.com/abstract/pulmonary-tumor-microemboli-a-rare-cause-of-dyspnea/. Accessed April 22, 2019.